When Blount County farmer John Davis decided to enter the switchgrass business, he did so with some trepidation. "I'm a cautious individual," said Davis, who last year planted the native grass on less than an eighth of his family farm through a contract with Genera Energy, which is working with more than 60 East Tennessee farmers to grow the up-and-coming bioenergy crop. He also wasn't sure he could part ways with the beef cattle business he'd been in all his life, even though, with today's production costs, the farm was barely breaking even. "I didn't know if I could make that leap or not," he said. "I didn't know if I would find it as interesting. Switchgrass doesn't have big brown eyes." One planting and harvest later, count Davis a switchgrass convert. "I've got a little less than 50 acres (planted in switchgrass)," he said. "If I had it to do over again, I would have committed 200." Thanks to millions of dollars from the state of Tennessee, along with federal sources, researchers at the University of Tennessee and Oak Ridge National Laboratory and corporate partner DuPont Danisco Cellulosic Ethanol are working out the science and mechanics of turning plants into transportation fuel. DuPont Danisco produced 5,000 gallons of cellulosic ethanol last year at the pilot biorefinery in Vonore, Tenn. - capable of producing up to 250,000 gallons of the fuel - and plans to produce between 100,000 and 150,000 gallons this year. Starting with cob and other leftovers from production of corn, DuPont Danisco will begin putting switchgrass through its paces this quarter in a smaller production unit associated with the biorefinery and will transition to the larger process later this year, said company spokeswoman Jennifer Hutchins. This year DuPont Danisco will announce plans for a commercial-scale plant located in East Tennessee, producing 25-50 million gallons of ethanol, she said. The biorefinery would go on line in 2014. Key to those plans are farmers like Davis, who - with the help of state incentives to grow the new crop - are helping lay the groundwork for a much larger network of switchgrass farms. The company estimates that it will require 60,000-70,000 acres to supply the commercial biorefinery. "We're going to need a lot more (switchgrass) for a commercial facility, so that takes some time to establish," Hutchins said. Tennessee has a head start, according to those inside and outside the local effort. With more than 5,000 acres of switchgrass now growing in 10 counties within an approximately 50-mile radius of the Vonore plant, Genera has the beginnings of a production model unique in the fledgling biofuels industry, according to Jim Lane, editor and publisher of Biofuels Digest. The publication recently bestowed Genera with a Feedstock Development of the Year award for its work. "They are doing things that are really important," Lane said. "They are developing a bio-based economy for energy crops." On a small plot at one of the University of Tennessee's research campuses lies a patch of switchgrass that recently completed its 24th growing season. "UT, in particular, has been working on switchgrass since the late '70s," said Sam Jackson, vice president of feedstock operations for Genera Energy. Tall and willowy, dense and hardy, switchgrass grows natively in the lower 48 states, and a number of ornamental varieties grace garden landscapes. "A lot of people think this is a new thing, and it's not," Jackson said. "I would be willing to bet that most people drive by a switchgrass plant on their way to work every day." Identified early on for its attributes as forage crop, switchgrass did not become a prime candidate for bioenergy use until the early- to mid-1990s, Jackson said, when research indicated the quick-growing, native plant could hold stores of energy potential within its sturdy stalks, which can grow up to 12 feet in height. Unlike corn-based ethanol, cellulosic ethanol comes from the harder-to-reach sugars locked inside the biologic cellulose and hemicellulose that help make up the structure of plants. The benefits are that switchgrass and other plants provide more bang for the buck than their food-based counterparts. Cellulosic sources don't compete with food (the growth in corn prices thanks to a spike in demand for corn ethanol a couple of years ago showed how tricky that balance can be) and can be grown relatively inexpensively on land unsuitable for other crops. Switchgrass is on track to be the first non-residue, non-waste, non-food biofeedstock made into transportation fuel. That's key to meeting national renewable fuel standards set by Environmental Protection Agency mandates that 36 billion gallons of renewable fuel must be enter the transportation market by 2022, Lane said. "If you talk to most people about the kinds of feedstocks they're going to use in the short term, they talk about waste," he said, whether it be animal, municipal or leftovers of other farm crops. "But when you talk to people about how the United States … (is going to meet) the renewable fuels standards … everybody starts to talk about dedicated energy crops." It's crops like switchgrass, Lane said, that will be the key to displacing the country's dependency on foreign oil. The mid-decade spikes in oil prices pushed the federal government to put serious funding toward the development of cellulosic biofuels. The state jumped on board, with Gov. Phil Bredesen pledging $72 million to build the pilot biorefinery, fund switchgrass production and kickstart related research. 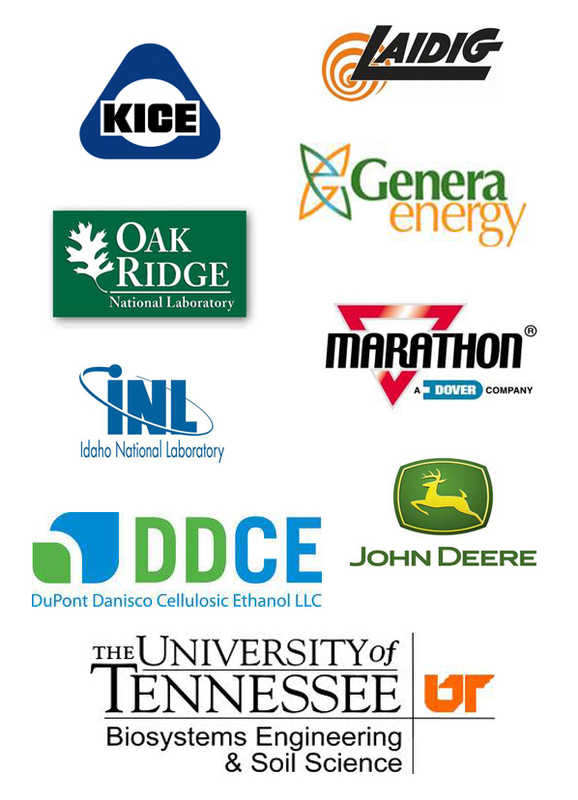 With that state support, in 2007 ORNL - with a number of partners including UT - won $135 million in funding for the Bioenergy Science Center, which is carrying out more basic research in all areas of biofuels production. In summer 2008, after a false start with alternative fuel developer Mascoma, DuPont Danisco signed on as corporate partner to produce the ethanol. And earlier that year, 16 East Tennessee farmers planted the first acres of switchgrass grown, not as dinner for cows or garden accent, but for fuel. Feedstock development represents 40-50 percent of the cost to make cellulosic ethanol - and "that could be conservative," according to Jackson. DuPont Danisco doesn't disclose estimates of feedstock costs, Hutchins said. So while the scientists are busy fine-tuning the recipe for cooking up biofuel, it's equally important to figure out how to cost-effectively get the switchgrass from "farm to plant gate," Jackson said. Genera and UT have a number of projects researching a spectrum of issues, from plant genetics, weed control and baling to prepping switchgrass for final distillation into ethanol. Building an agri-economy from scratch means you have to figure out "how it's going to be grown, who's going to grow it, terms, how it's going to be collected," said Lane. "There are only a couple of groups in the world that are doing that logistic work right now." Solid data existed showing the viability of switchgrass in Tennessee, with accurate predictions of yields using present varieties and potential issues related to establishment, Jackson said. "What we weren't confident (about) and what we've learned a lot about is just the day-to-day (and) annual management of switchgrass field to scale," he said. "I think we have a very good handle on establishment and growing. What we're trying to do now is basically refine the system to continue to lower these costs and increase establishment rates." UT is embarking on a new initiative, led by researcher Al Womac, to develop a system for reaping, storing and preparing the feedstock after the farmers' work is done. "You don't know what problems to anticipate until you actually do it," said Womac, who over the next couple of years will be testing each part of the system at Genera's new Biomass Innovation Park, still in development adjacent to the biorefinery in Vonore, that will serve as staging ground and test center for the feedstock. In addition, breeding and genetic modification of plants will be necessary to improve yields and establish the crop to make it cost effective for production companies. For example, while switchgrass plots now yield 8-10 tons per acre, DuPont Danisco needs and anticipates that production will increase to 10-12 tons per acre by the time commercial production gets under way, according to Hutchins. "They're certainly on target to meet those yields," she said. And, because it takes three years to establish the crop, DuPont Danisco will need to begin working with farmers in the coming months to guarantee a supply of feedstock long before the company breaks ground on a new plant. "This is a very difficult industry to set up because we just can't solve one problem at a time," said Sarah Bittleman, senior adviser to U.S. Agriculture Secretary Tom Vilsack, at a recent biofuels forum in Knoxville. "It's the largest and most complicated pop-up book the world has ever seen." A total of 61 farmers now make up the group of pioneering producers in the still-to-be-demonstrated biofuels market. Each of the past three years, Genera has added to the number, expanding the acreage and type of land on which it sows the tiny seeds. The contracts are structured to be a realistic estimate of what producers could expect to get from the crop when a commercial facility arrives while still providing farmers an incentive to be the guinea pigs in an expansive and costly experiment, said Jackson. They're also set up to skirt the "food versus fuel" controversy as much as possible, he said. "Realistically for the biofuels market, if it's high-quality land that's producing significant bushels of corn or soybeans, switchgrass will never compete economically against that. You'll never be able to set that price high enough because you can't. It's just a market-driven thing," he said. "So when we went into this program at the outset, we wanted to be realistic in what we expected the ultimate market price of switchgrass to be and recognize that you don't want to set the bar too high in an incentive program." For the first year of the three-year contract, the farmer is paid a set price of $450 per acre to help get the crop established. In subsequent years, producers are paid a sliding percentage of flat fee and amount per ton as production ramps up. Most farmers participating in the process seem pleased with the arrangement. "There is no way, shape, fashion or form that I could produce any legal crop that could make me that much money," said Davis. "I'd be lucky to have gotten $100 an acre out of my cattle on a good year." Early on, the program targeted experienced farmers working high-quality land, suitable for row crops to ease the learning curve. But in subsequent years, contracts have embraced lower quality pasture lands managed by part-time, more inexperienced producers. "We've put (switchgrass) on a lot of really poor, rough land," said Jon Walton, area specialist with UT Extension, who, with colleague Ken Goddard, works with farmers and researchers developing best practices for switchgrass production. The group includes about 40 full-time and 20 part-time farmers. "We've got everything from the best farmers in the country to people we had to teach how to start the tractor," Walton said. With so much land required to supply a commercial plant with feedstock, it will be key to have experience with all types of land and producers, he said. So far, results have been promising, with farms on average, upon reaching full production after three years, producing 7-10 tons per acre. "Every field is different, every farm is different," Walton said. "Being three years into it we know a whole lot more than we did to start with." There is risk associated with turning land over to switchgrass production. It takes three years to establish the crop, which is easily dwarfed by certain weeds during its early months and can be stymied by drought. And while DuPont continues to meet milestones in its march toward cellulosic ethanol production, the company has yet to put permanent stakes in the ground. But Davis said he won't be out anything, even if the project goes bust. "You've still got grass on the ground. It's not a bad grass," he said. "Some farmers are actually establishing switchgrass as part of their cattle operation. There's a fallback plan." What all this elaborate prep work will mean for the local economy is difficult to tell. DuPont Danisco consistently has said it plans to build a commercial facility in the region, and Hutchins indicated that there are currently several sites under consideration and that the commercialization process is on track. "We definitely will make an internal decision … probably by second quarter," she said. "We'll definitely make an announcement this year." Given the state's level of commitment to biofuels, there certainly are hopes for other follow-on investment. But the project has coincided with an economic downturn slow to reverse and an uncertain political landscape that has both benefited and stymied the new technologies surrounding biofuels. As a result, banks have held on to their money, and federal loan guarantee programs used to prod financing have stalled along the way. A U.S. Department of Agriculture guarantee program could be eliminated altogether, if a bill introduced -but not passed - in Congress last fall is resurrected this year, Lane said. Still, he said, the industry is moving forward, and such delays may be for the best. "The technologies have continued to be developed, and they're just better," Lane said. "Virtually every company is going to come out with a more robust, advanced version of the technology. We certainly have had more time for people to get used to the idea of these new fuels." If the state cashes in on its biofuels bet, the new industry promises to breathe life into local rural economies that have seen traditional industries flee and residents move to larger cities for jobs. Because of the cost of transporting switchgrass and other feedstocks, plants must be located near the farms that serve them, contributing jobs, feestock contracts and opportunities for tertiary suppliers to the region. "I think that services will develop in these counties," said UT economist Burt English. "Entrepreneurs would grow up … to become truckers and harvesters." From a national perspective, to displace 25 percent of petroleum-based fuels with renewable sources by 2025 will require 100 million acres in dedicated biofuels crops, resulting in 5.7 million jobs and $750 billion in economic impact, he said. Such projections are playing out on a small scale at the Rymer farm in Polk County. Harry Rymer, who also is a chicken producer, was one of the first 16 farmers to get into switchgrass, planting on 68 acres - some his own land and some leased. He's added to the plots each year, leasing an additional 319 acres in Polk, Bradley and McMinn counties. If the market develops, Rymer said he aims to plant about 600 acres. Getting into the business in earnest required Rymer to buy a couple of larger tractors, discing equipment and a new baler to handle the crop. And last year, Rymer was joined in the business by his son Jay, who had been working as an industrial valve repairman in Bradley County because prior to the new venture the farm couldn't support both. "Our farm's been in our family for 100 years," Rymer said. "It's good to keep it going." On a recent winter day in Tellico Plains, a handful of switchgrass growers gathered at Stokely Farm to watch what a garbage compactor could do to a truckload of switchgrass. As a frontloader dumped the freshly harvested, chopped grass into the receiving bin, the compactor compressed it into 5-foot-by-6-foot bales, cramming in more than twice the hay as the traditional bales that farm equipment produce. Wrapped in plastic, the bales will be monitored by researchers at Genera Energy to determine how well the method preserves the quality of the switchgrass as they analyze a variety of ways to harvest and store the crop. 'This is basically preprocessing in the field. That's cost and energy savings in the process,' said Sam Jackson, Genera vice president of feedstock operations. And with the technique, 'you don't have to worry so much about weather and timing of harvest. The bale is ready for storage,' he said. The project is one of many geared toward testing the harvest, pre-preparation, transport and storage of switchgrass now growing in 61 farmers' fields surrounding a pilot biorefinery built by Genera and partner Dupont Danisco Cellulosic Ethanol in Vonore. With many of the basic issues resolved related to cultivation of the plant at the farm level, Genera and researchers at the University of Tennessee are turning their attention to bridging the gap between farm and final production. In the cramped office of Al Womac, a professor of biosystems engineering at UT, sits a blueprint of sorts outlining the many steps through which the switchgrass must pass — from plant in the field to the final feedstock product, a powder approximately the consistency of cornmeal. In between, the switchgrass must be mown and moved, stored and moved again, chopped, preprocessed — which uses liquid ammonia to begin breakdown of the plant — and conveyed to the biorefinery itself. As in the demonstration described above, researchers will work to determine the best method and timing of harvesting and preparing the crop for storage. This could include baling — round or square — or chopping the crop on site. Storage is a huge issue in the pre-production process, Womac said. Literally. Supplying a 50 million-gallon-per-year commercial biorefinery will require the equivalent of a stack of 4-foot-by-4-foot-by-8-foot switchgrass bales that are 32 feet tall covering more than 100 acres. That means finding an effective, efficient way to store the feedstock — probably not in the aforementioned square bales, as ensuring it stays in good condition and controlling the harvest and delivery of the crop is crucial to the industry's bottom line. For example, experiments have shown that when switchgrass gets wet, its ethanol production drops by more than 70 percent, Womac said. One project will compare bulk storage to bale storage to determine which results in the best quality going into to the biorefinery. The work also will include testing the handling equipment for switchgrass when it arrives onsite to be prepared for production into fuel. A number of companies are partnering with Genera and UT to help determine ways existing equipment used in other agriculture-related industries — such as sugar and wood — can be modified for switchgrass. Larisa Brass is a freelance contributor to the News Sentinel.